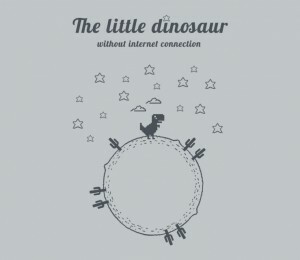 Do you wonder where the little dinosaur goes after your Internet comes back on? He travels the galaxy jumping from planet to planet. Turns out he really can jump a whole lot better on his own than when you press the spacebar to make him jump. Don’t know what I’m talking about? Pull up Google Chrome next time your internet is out. You’ll see the dinosaur. Press spacebar and see him run. And then realize that when your internet is back on he’s exploring the universe. And you just pulled him away to make him jump over cacti. Way to go.